Want to get involved with the GROW Neighborhood Gardens? Fill out this volunteer form. GROWCommunity elementary school families are invited to the GROWCommunity High School Fair at Amundsen High School. Visit with various public and private high schools to learn more regarding admission for the 2019-2020 school year. 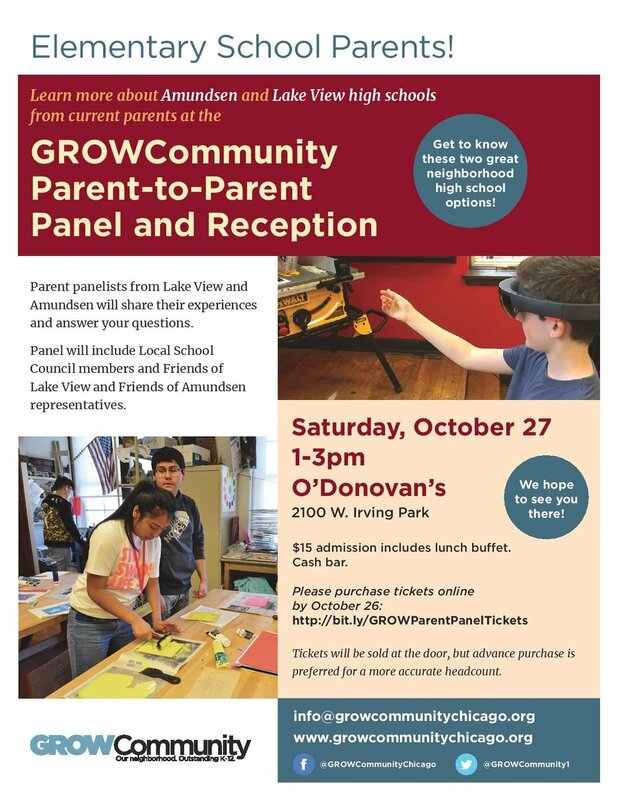 A great opportunity to learn more about your GROWCommunity neighborhood high schools, Amundsen and Lake View, as well as explore one of the campuses. Amundsen High School, 5110 N. Damen Ave. Excited about GROWCommunity and the K-12 neighborhood pathway we're building? Help GROW Grow! Join our volunteer team. All levels of involvement welcome! Learn more at this volunteer information meeting. Spread the word! Meeting flyer here. 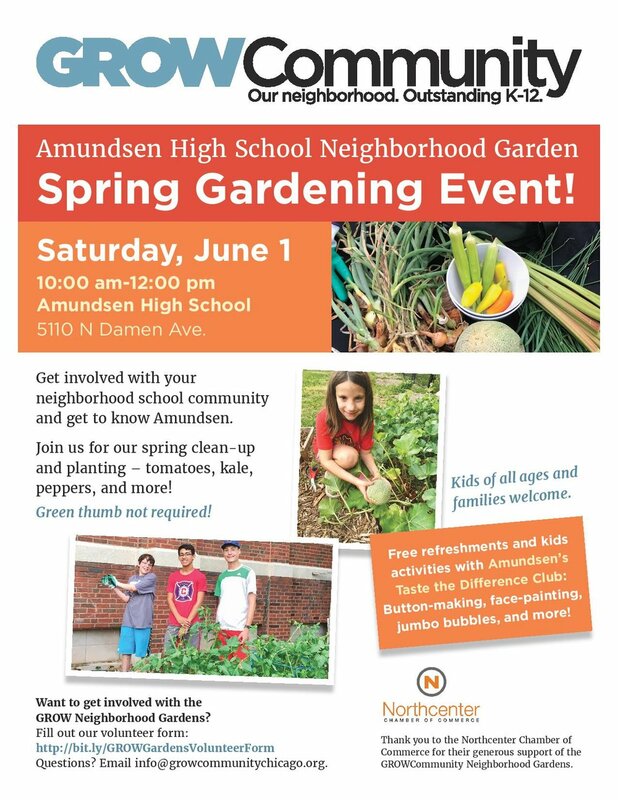 Join us for the spring planting in the community gardens at Amundsen and Lake View. Kids of all ages and families welcome. Get to know other people who want to be part of our great neighborhood high school programs! Free kids activities: Button-making, plant make-and-take, and more! The Amundsen event is in the morning and the Lake View event is in the afternoon. You're welcome to attend both or just one of the event sessions! Students and Parents — Stop worrying! Start learning about your top-notch neighborhood public high schools! The Main Event: Amundsen and Lake View In-Depth, Breakout “mini fairs” with school representatives including current students, Principal Anna Pavichevich and Principal Paul J. Karafiol. Learn firsthand about everything from academics to arts, athletics and school clubs. Everyone is welcome! Complete details. Co-Hosted by GROWCommunity and Coonley Elementary. GROWCommunity is forming a Communications Committee to drive our efforts to shine a spotlight on the amazing things happening in our neighborhood schools and support the communication needs of our various outreach events. We welcome anyone interested in volunteering to the Communications Committee kick-off meeting on Thursday, March 8, at 6:30pm. This meeting will give you a chance to hear more about our communication efforts and help you understand how you can get involved. All are welcome—no experience necessary! Please meet at the main office at 8:20am. Tours will begin at 8:30am. Guests may enter Door 6, along Ashland Ave. Street parking is available. With the GROWCommunity Enrollment Policy, 8th grade students from any of the GROW elementary schools* who apply to Amundsen or Lake View through GoCPS will be guaranteed admission, regardless of where they live. This webinar will walk prospective families through the process of accessing these seats through the GoCPS application. *The 17 GROWCommunity elementary schools are Audubon, Bell, Blaine, Budlong, Burley, Chappell, Coonley, Greeley, Hamilton, Hawthorne, Inter-American, Jahn, Jamieson, McPherson, Nettelhorst, Ravenswood, Waters. The webinar will be led by GROWCommunity Executive Director, Sarah Makela, and Hamilton Elementary Counselor, Lynda Gardner. Lake View High School invites you to the 2017 Open House. Come learn about what it means to be an Early College STEM School. Our Academic Departments, Student Support Services, and Extra-curricular Sport and Clubs will be on hand to share how Lake View High School is a HOME for all students. Join us for a community work day as we get our new GROWCommunity Gardens up and running! Come one, come all – students, parents, teachers, neighbors, everyone! This event brings together the GROW elementary and high school communities and the community at large to launch new gardens at both Lake View and Amundsen. We're working at Lake View in the morning and Amundsen in the afternoon: You're welcome to help out at both or just one of the schools! 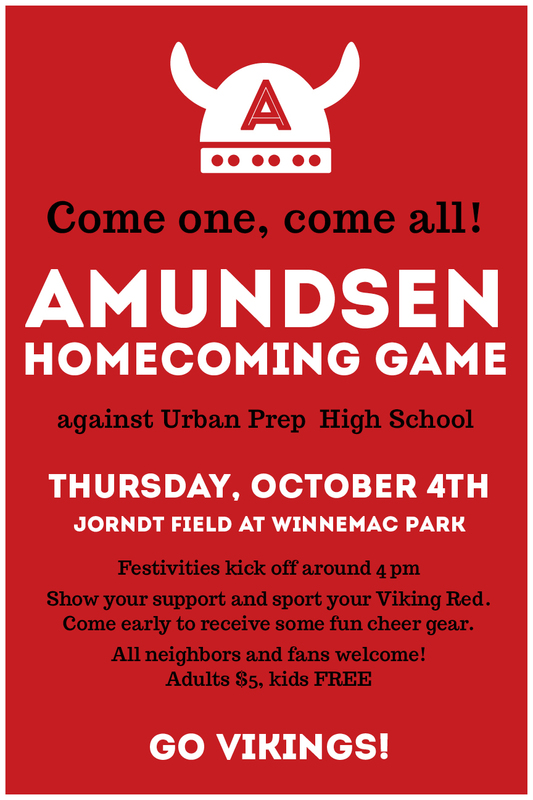 Homecoming Amundsen vs North Grand HS Football. At Jorndt Stadium. GROWCommunity elementary school families are invited to the Northcenter High School Fair at Lake View High School. Visit with area Chicago public and private high schools regarding high school admission for the 2018-2019 school year. This is a great opportunity for families to speak directly with representatives from your child’s future school. Navigate through Lake View High School visiting informational booths of area high schools. HOPE TO SEE YOU ON OCTOBER 12!